Over the past four years much has changed in Cincinnati’s urban core. New buildings have risen, historic structures have been saved, food trucks have proliferated, new businesses and residents have moved in, park space has been added, and transportation options have been and are improving. More importantly, though, a new generation of leaders has stepped up to champion Cincinnati’s dynamic urban core. During all this transition, UrbanCincy has remained a steady voice pushing for this change in attitude, and we would like to get together with all those who love Cincinnati and celebrate the four year anniversary of UrbanCincy this weekend. 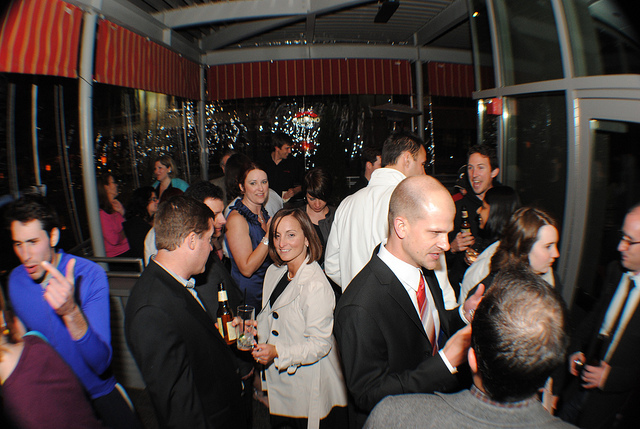 UrbanCincy’s 3rd Anniversary Bash at Via Vite – Photo by Thadd Fiala. This year’s party will take place at Below Zero Lounge on Saturday, May 7 from 9pm to 2am. At the party guests will be able to meet the team that makes UrbanCincy possible, and be treated to special music provided by DJ Casey Coston (9:30pm to 11pm) and Atlanta’s number one mashup artist, WiliOne, who is traveling to Cincinnati exclusively for this performance (11:30pm to 1am). If you are looking to get involved with the social scene in Cincinnati’s urban core, this is your chance. If you are looking to get to meet the people behind three-time Best of Cincinnati award-winning UrbanCincy, this is your chance. If you just want to go out on a Saturday and have a great time, this is your chance. Food will be available for purchase from Café de Wheels out on the street. Drinks are not included, but there is no cover charge for the party. Dress for the party would best be described as trendy/casual, but all are welcome. It has been a great four years and we are all looking forward to meeting the people that continue to go out there and make Cincinnati’s urban core a great place. We hope you can join us at UrbanCincy’s 4th Year Anniversary Bash.